For me, one of the factors that helps me maintain a healthy diet is keeping a well-stocked pantry. This ensures I always have the start of a great recipe at arms reach. If you’re new to plant-based eating and a little unsure of what the heck to eat, this list of how to stock a vegan pantry should help point you in the right direction. With all these items on hand, all you’ll need are your weekly fresh fruits and vegetables and you’ll be ready to start eating a healthy, plant-based diet. Every Sunday I make a quick meal plan for the week ahead, jotting down a grocery list to pick up everything I need. My list is usually quite short because of these handy staples. If you’re a home-cooked meal beginner, you may have to go do one big shop to get started, but after that it will get much easier and much less expensive. Personally, meal planning and food prep are the keys to a healthy diet. With these staples on hand and a meal plan for the week, it’s so easy to stay on track and enjoy simple, delicious, healthful meals at home. Meal planning also saves money, reduces food waste and saves time in the kitchen. I’ve found that by keeping an organized and visually-appealing pantry, I’m much more likely to use the foods I have on hand. By staying organized I also save money, prevent food waste and am able to keep foods fresher much longer by using a selection of storage containers. 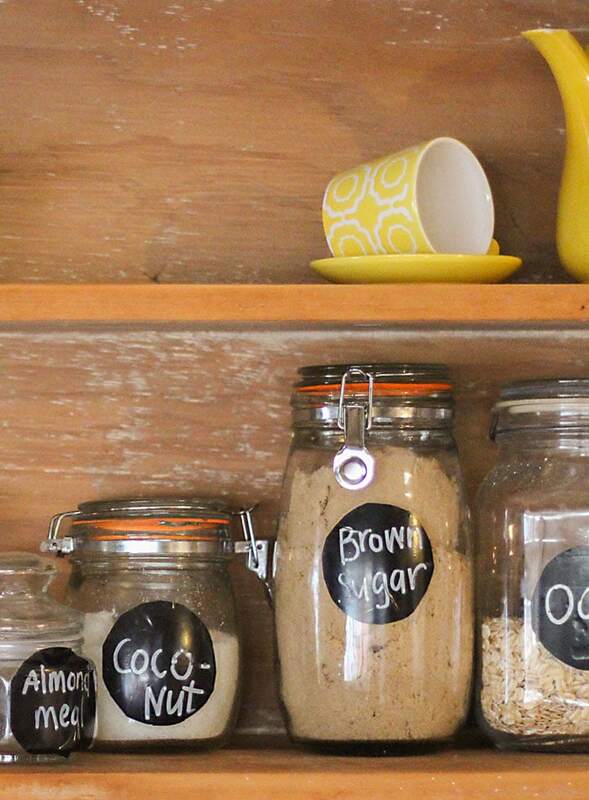 Here are my favourites for storing food in both the pantry and the fridge and freezer. Ball Mason Jars – Mason jars are an affordable and beautiful way to organize your kitchen. I like wide mouth jars best for easy access. Flip-top large and small jars are also good for storing pantry items. You can also buy plastic lids to prevent the metal ones from rusting, you can pick up a set of 8 storage lids for under $3. Weck Jars – Weck jars are one of the cutest and most beautiful ways organize to your pantry and store food in the fridge. They just looks so good all stocked up with grains, seeds or nuts or stacked in your fridge with food prep items ready for the week. They’re also perfect for everything from smoothie bowls to overnight oats and great or storing sauces and other small-batch items that need to be refrigerated. 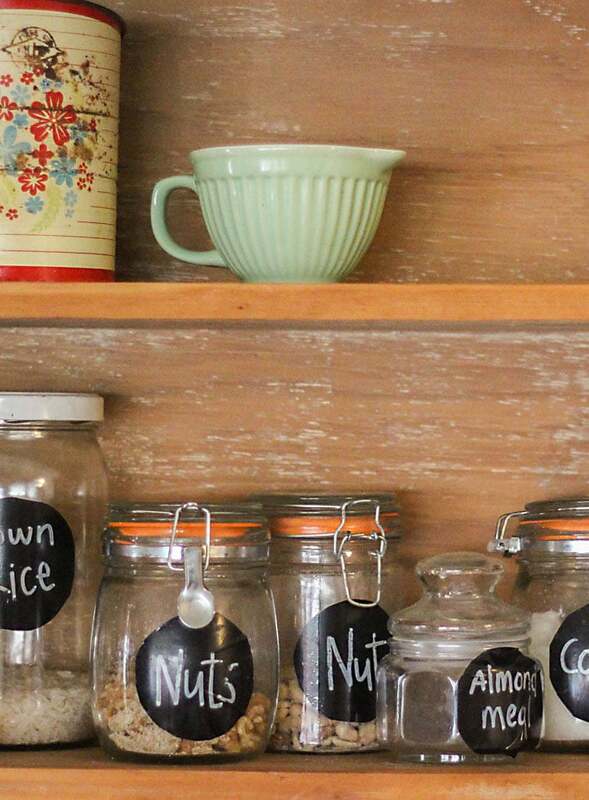 I have a selection of jars from the small and medium jars that are great for fridge items, to the tall and skinny jars that are great for storing items like grains, nuts and seeds in the pantry. Glasslock Containers – These BPA-free and recyclable glass storage containers are excellent for storing prepared food in the fridge or freezer and for taking food on-the-go. They keep food fresh and are oven and microwave-safe. Airtight and leak-proof, they’re the way to go! You can grab a full set for about $35 on Amazon and the small upfront investment really pays off in the long run. Flip-Top Hermtic Seal Jars – I also love Hermetic seal flip-top jars for storing everything from pantry items to fresh food in the fridge. You can even buy small ones that are perfect for storing spices you’ve bought in bulk. The wide-mouth ones are awesome for pantry items and they can even be used for fermenting. Having a variety of beans and legumes on hand for quick and filling meals is essential. Beans and legumes are inexpensive, a great source of fibre and provide energizing protein and carbohydrates with little fat. I like to keep a variety of both canned beans and dried beans and lentils in my pantry. Canned beans are easy to use straight from the can and they’re so versatile you can pair them with almost anything for an added boost of flavour, texture and nutrition. Cooking your own beans is really easy too and I’ll often include a batch of chickpeas in my weekly food prep. Whole grains are a wonderful source of fibre and complex carbohydrates. Grains are versatile, inexpensive, filling and a great source of vitamins and minerals. My favourites to keep on hand are quinoa and oats. Oats are probably one of the most versatile and wholesome items you’ll keep in your pantry. They’re perfect for quick breakfasts, can be used for homemade energy bars, granola bars and other baking requires, they make great pancakes and can even be used in recipes like veggie burgers. I use both brown and white rice in my kitchen depending on what I’m making and my nutritional needs are at the time. They’re both a good source of carbohydrates if you’re highly active and need a lot of energy! Read my guide to whole grains for more information on how to cook and store grains as well as their health benefits. Dairy and egg-free baking is easier than you might think and by stocking a vegan pantry you’ll be able to create plant-based versions of all your favourite baked recipes. You can make everything from healthy donuts, to crackers, cookies, muffins, banana bread and even the most decadent desserts. Check out this post on how to replace dairy in your diet and this post for how to replace eggs in baking. If you’re gluten-free but still want to bake, you may need a few baking extras in your pantry. Here are a few of my staples for gluten-free baking and a few other pantry must-haves I like to keep on hand. Nut, seeds and dried fruits are essential for snacking, nutrition and adding to recipes. Nuts can be enjoyed for a healthy snack, used in recipes, added to oats and cereals, used to create amazing dressings and sauces, in homemade granola and so much more. I like almonds for snacking, cashews for snacking and making sauces and desserts, I use ground flax for replacing eggs in baking and adding to oats and smoothies. Pepitas and sunflower seeds are both packed with antioxidants and are great as a snack, added to salads or mixed into oats or granola. Chia seeds are a must-have for me because I love making all kinds of chia seed pudding variations. Hemp seeds are my favourite superfood for their amazing nutritional profile, especially if you’re an athlete! Dates are essential for creating energy bars and balls and they make an incredible dessert or snack when stuffed with almond or peanut butter. Coconut is awesome for raw food recipes, baking, making granola, snacking and adding to smoothies. As for granola, if I find something delicious on sale, I’ll usually pick up some store-bought granola but granola is also really easy to make if you have the rest of these pantry staples on hand. You can try my Easy Peanut Butter Granola, Sugar-Free Cinnamon Raisin Granola or Mocha Granola if you’d like to try making your own. I like keeping a few containers of unsweetened applesauce to use for replacing oil and sugar in baking recipes, or even just eating as a snack on it’s own or mixed with protein powder. All of these foods are versatile, nutrient-dense and can used countless ways in a plant-based kitchen. This is my favourite category of plant-based pantry items! If I could, I would stock every version of nut butter I could get my hands on! My top 4 are natural peanut butter, almond butter, tahini and sunflower seed butter. I eat nut butters every day on toast, on top of pancakes or oats, mixed into smoothies or as smoothie bowl toppings, in sweet potato breakfast bowls, in dressing and sauces and just by the spoonful for a snack! I also use them to make homemade energy bars and balls and in baking. I use tahini, or ground sesame seeds, almost daily in everything from dressings, to salads, to smoothies, to oats, to toast and even in desserts. Tahini is one of my favourite ingredients and a must-have in my kitchen. I like making my own coconut butter to use for snacks, adding to smoothies and oats, using in recipes and spreading on toast and baked items. It’s very easy and inexpensive to make at home. To make it, add one package of unsweetened shredded coconut to a high-speed blender and process until it turns to butter. This can take anywhere from 5 to 10 minutes, or maybe a bit longer depending on the coconut you use and your blender. Be patient, it might seem like it’s not going to happen but then all of a sudden you’ll have the creamiest, most amazing coconut butter you can imagine! I like adding a bit of sea salt and vanilla too. It’s incredible. Once it’s finished, store in a sealed container in the pantry. If you can find a good deal on store-bought coconut butter (sometimes called coconut manna in stores), go for it. You will love the amazing taste and texture of coconut butter, it’s a wonderful source of energy and a versatile item to have on hand. I always keep a good stock of canned items for quick meals when I’m low on fresh foods and for using in recipes. Tomato paste adds richness to sauces, stews and soups. Diced tomato is great for soups, chili, stews and adding flavour and liquid to plenty of other dishes. Coconut milk and light coconut milk is great for desserts, curries, cooking grains or cauliflower rice, adding to smoothies, using in baking and so many other recipes. I typically use light coconut milk in recipes like curries and soups to keep the fat down and I’ll use full-fat coconut milk if I need the fat in a creamy dessert like vegan cheesecake, ice cream or mousse. You can also use full-fat coconut milk to make your own coconut cream. I used canned pumpkin a lot for smoothies, oats, pudding, desserts, baking, soups and curries. It’s versatile, nutritious and convenient. Switching from refined sugar to natural sweeteners is one of the best things you can do for your health. Although when it comes down to it, these are still sugar, some of these, such as molasses, offer a range of health benefits along with their sweet taste. They also fall lower on the glycemic index than refined sugar, meaning they won’t spike your blood sugar as much. I like raw coconut sugar for baking, I use pure maple syrup to sweeten raw food recipes and as a treat on pancakes and waffles, molasses is one of my favourite pantry items and I love it for creating gingerbread-inspired recipes or as a natural sweeter for granola and in baking. I use stevia quite a bit for creating sugar-free desserts with no added calories from sugar. I find liquid stevia to be the easiest to use and have the best flavour but I often use powdered stevia in baking and other recipes when I’d like a more exact measurement. I don’t typically stock these items but if you prefer you can use agave nectar or brown rice syrup as an alternative to maple syrup in recipes. I use xylitol and erythritol every once in a while in baking but I’ll usually just buy it if I need it. 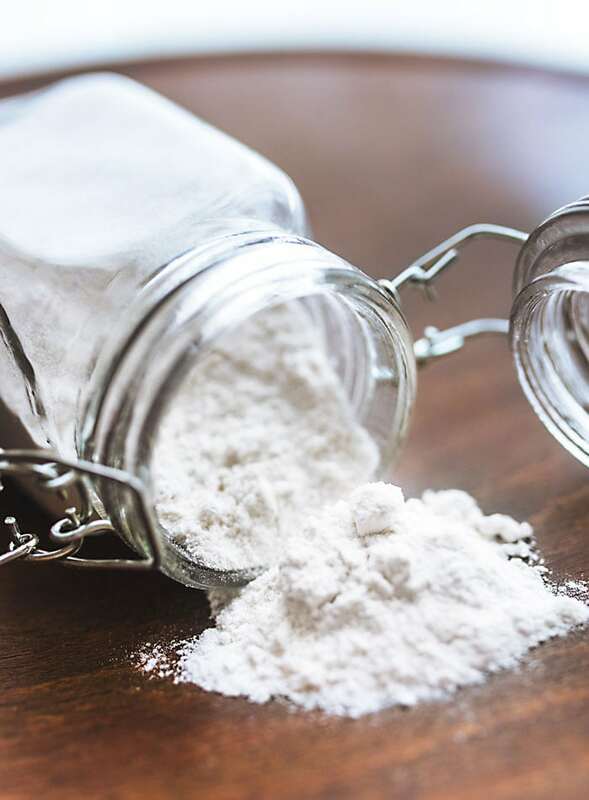 If you bake a lot, xylitol or erythritol might be handy to stock for low-sugar baking. Monk fruit can be used an an alternative to stevia for sugar-free sweetening. Having a good selection of various oils, vinegars and sauces on hand is key to creating healthy sauces and dressings and flavouring recipes without the use of added salt. I don’t use much oil in my kitchen but I do stock olive and coconut oil so they’re there when I need them. I’ll use olive oil on occasion for making dips and salad dressings and coconut oil for making raw desserts and for cooking and baking. I use sesame oil every so often for adding flavour to Asian-inspired dishes. I love apple cider vinegar for dressings and salads and even just adding a splash to water for it’s health benefits. I use a lot of rice vinegar to make Asian-inspired sauces and I use red wine, balsamic and white wine vinegar a lot in all kinds of recipes, sauces and salad dressings. As for tamari or soy sauce, tamari is a gluten-free option if you’re concerned. I usually just buy low-sodium soy sauce and I use it quite often in dressing, sauces, curries, soups and as a condiment on rice and stir-fries. These are the spices I use the most, there are many others in my pantry that I don’t use very often. For me, these are the basics and I use them all on a regular basis. If I had to narrow it down, I’d say my key staples are turmeric, curry powder, cumin, cinnamon garlic powder, salt and pepper but please don’t make me, I love them all! 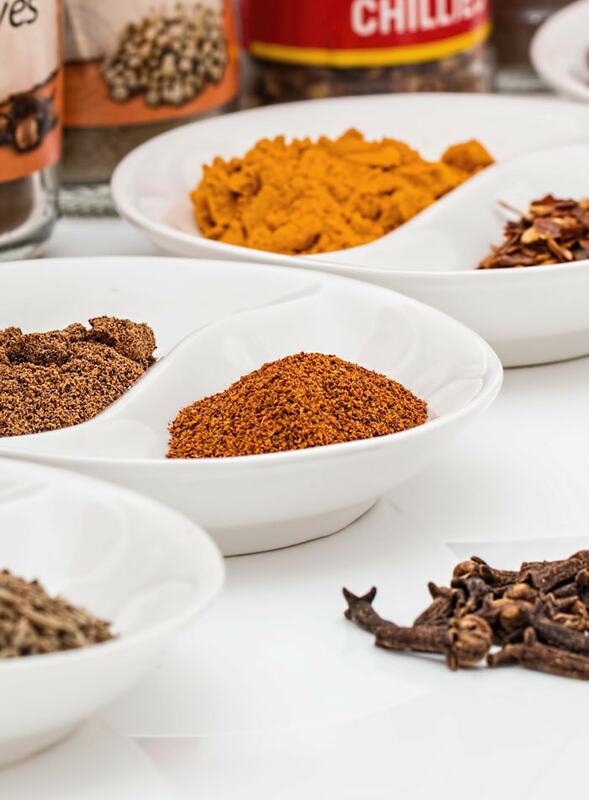 Not only are spices and herbs a great way to flavour food without added salt, they all offer their own host of health benefits and take healthy eating from bland to woah. sweet potatoes – must-have for a healthy source of complex carbohydrates and nutrition, for making fries, sauces, breakfast bowls, protein cookie dough, soups and everything in between! dijon mustard (keep refrigerated) – must-have for calorie-free dressings, sauces, and of course, veggie burgers and veggie dogs! These are a few of the superfoods I stock on a regular basis. They’re totally optional but to include them in my diet for a nutritional boost. I hope this list helps steer you in the right direction when you’re stocking your plant-based kitchen. Now that you’ve got all these staples on hand, it’s time to get into some food prep! Check out this post, this post and this post for 3 weeks worth of food prep ideas and inspiration. And remember, things don’t have to happen all at once, if you’re new to eating plant-based, take it one step at time and remember that there’s power in small change. Wow I just love this post! Before I read your post I read the title and became very interested. I’m a vegan my self and am always looking for new ideas, as I read your post I noticed that everything you put down I already own. It feels good knowing I’m on the right track to keeping my pantry well stocked. Thank you! P.s do you have good recipes for all types of beans, and my dry beans always turn out hard how do you fix this? Honestly, I use canned beans for pretty much everything – I try to rinse them really well to remove some sodium but I know I should switch over to dried, it’s just so easy to do canned! I do use dried lentils, but I don’t do anything special to make them. I just follow the directions on the package. Awesome post! This post does what I’ve been meaning to do for a newly vegetarian friend! Thanks! I hope it helps her out! Great list! This is pretty close to how I keep my pantry stock for clean eating. 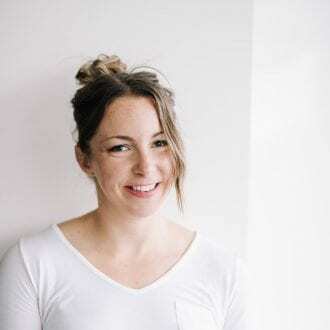 Nice to see it all in one place, I know transitioning to a whole food kitchen can be overwhelming at first this is a great go to if your just getting started, thanks for sharing!